I'm further venturing out into the world with this My Favorite Things challenge. It's a "Who's that Girl" challenge. I love Who's that Girl, she's always doing such fun stuff. This is the only set I have with her, called Here's the Scoop. The challenge was to make a card with ONLY 2 layers. Yikes! And the base counted as one layer. Quite the challenge! I cut out my stamped image with a border around it and colored the border brown to give it the look of a mat. I was going to stamp the base layer with a background stamp but I wanted to put the sentiment on there so I opted not to. I added some Primas with brad and some rhinestones. That's it. I think I'd be happier with this if it had more layers but I did what I could. This next card was supposed to be for the Verve sketch number 3 but my apples were a whole lot bigger than I had originally thought so it didn't work with the sketch. That and I didn't want to cover up the cute DP with too many layers. Well, AND the twist to this sketch was to add pink. Basically, this card doesn't fit the challenge at all. But I still like it. I think it's cute. This uses Mix Up of Cuteness from Unity. 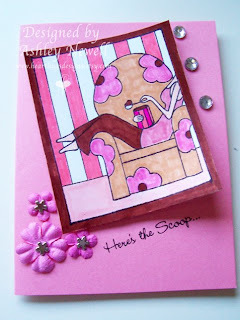 I'm really sick today but I am still going to try very hard to have a post for tomorrow with my Flutter By card. Hope you all are feeling better than I am! You cards don't look like they were made by an ill person! I hope you feel better soon girlie! Your cards are cute!!! Sorry you're not feeling well...been there, done that. Get better soon!!! Those cards are beautiful! I hope you feel better soon. There is definitely something going around, everyone at my workplace is sick as well. Super cute Ashley! I love that DP what is it! Tessa, the DP is for a fall $1 pack from Target. Love your cards. The apples are cute! 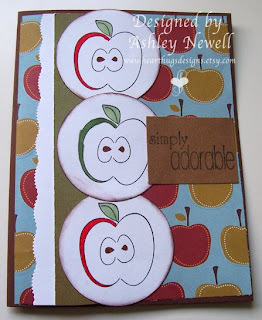 Cute cards Ashley...love that apple paper! Hope you are feeling better soon...take care! Love the cards. you are doing such an awesome job!!! cute cards Ashley, only 2 layers?? now that would be a challenge for me :). Hope you feel better.